Copyright © 2017 Balmoral Software (http://www.balmoralsoftware.com). Portions copyright © 2006 Animation Arts Creative GmbH & Fusionsphere Systems Ltd. All rights reserved. Republication, redistribution or conversion is expressly prohibited without the prior written consent of Balmoral Software. Secret Files - Tunguska is the first in a series of three games from distributor Deep Silver using an excellent game interface from Animation Arts. In this interface, the spacebar can be used to highlight all hotspots in the current game panel, and the mouse icon shows in green which mouse buttons can be pressed. Left-clicking initiates active verbs, such as Use, Take, Open, Put, Move, Give, Talk to, Select, Enter, Exit and Combine (in the inventory bar). Right-clicking executes passive verbs such as Examine or Read, and can be used to skip video sequences and dialog. Unfortunately there's no way to speed up character movement except when using the double-click option to exit a scene (this was improved in the game sequels). The top center of the screen is usually a safe place to position the cursor when right-clicking to skip dialog sequences. If you have the subtitles turned on, dialog from different characters is shown in different colors, and when a character is thinking rather than talking, the text is shown in italics. When an inventory item is added, consumed or changed, an icon appears briefly at upper left as a reminder. Most of the puzzles in the game are inventory-based. A few chapters are terminated with standalone puzzles, but these are easy and also have optional hints within the game. The first and last on the car, a fourth of the openings in the entrance to the underworld, and finally, the guardians of my work. Whether vertical, horizontal, or in both main diagonals: make sure that there is never a repeat within a line. Note that all wingnuts used must be returned to inventory before they can be reused. 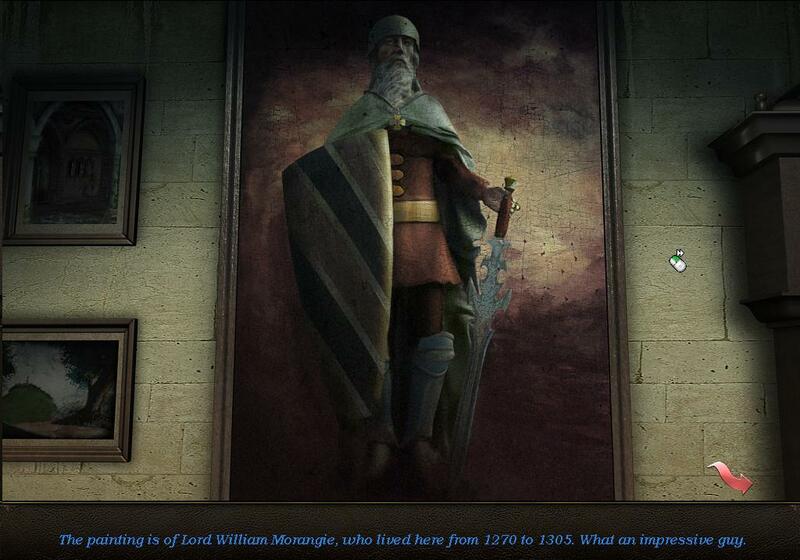 This painting of a previous Lord Morangie shows him attired with amulet, shield, sword, shin guards, helmet, etc.